Todd Schiller, a ’98 graduate of Johnson & Wales, was named one of Washington, DC’s top 10 hottest chefs by DC Style magazine in 2006. 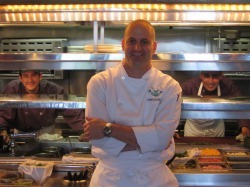 He was the Executive Chef of Kinkeads, the James Beard Award winning restaurant on Pennsylvania Avenue, for 4 years. He worked at The Inn at Little Washington, Red Sage, and The Fat Duck in England. He has cooked with Daniel Boulud, Thomas Keller, and Heston Blumenthal. DC was fun, but Todd got homesick and he and his family moved back to RI. After working at several restaurants, ending at Forty 1 No in Newport, Todd is happily R&Ding for Whole Foods Marketplace. In his new found free time, he'd like to meet some people who like food as much as he does.